We will embark on our graphic design study abroad program in Japan on the 9th of September 2008. 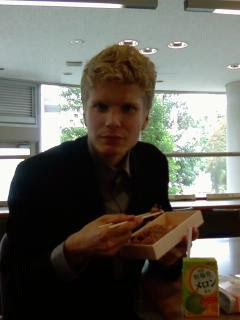 We're studying at Josai International University (Near Narita) for a period of 4 and a half months. Alongside our design studies we will also be learning Japanese. Hope you like our blog! Today was officially our first day at Josai International University! There were 2 main objectives today. The first was to attend the university`s opening ceremony. The second was to take part in a written Japanese language test to inform the tutors of our Japanese language level. On the walk to the university this morning I was subjected to Kalvins endless grumblings about having to wear trousers and a blazer in such hot weather! He was right though and by the time we`d reached the university we were pretty uncomfortable. The ceremony was extremely formal. There was a lot of talking and bowing and lots of important looking people gave speeches. On arrival It felt like we were entering a high-security presedential building. Men in black suits with ear pieces were everywhere. When we left the ceremony we were given a rose and a little boxed lunch which contained some rice and beans and stuff which was nice. Next was the test. We sat down in a room with about 50 other students (none of whom were English) and were handed 100 questions on a sheet of paper. Trouble was all the questions were written in Japanese. I remember just looking at Kalv and knowing exactly what he was feeling. Our hearts sank, nothing was written in English. The problem with Japanese texts is there are 3 Japanese written languages; Kanji, Hiragana and Katakana. Me and Kalv are reasonably comfortable with hiragana and know a bit of katakana. However, unless you know all three you`re pretty stuck because the texts combine all of them. With some questions I was like "hang on, I think i can understand this one" and then there would be a big fat Kanji character that would render the whole sentence meaningless to me. Ah well, at least we gave it a shot. I guess what this means is that we`ll be put in the lowest class. I found an internet Cafe!